Fans of indie rock, get ready for the most fun night of your life!! It’s the masterminds behind the global smash hit “Pumped Up Hits,” the amazing Foster The People at the Stage AE on Sunday 4th June 2017!! Tickets will sell out FAST for this massive event so don’t delay in getting yours – hit the “Buy Tickets,” button NOW!! Formed by Mark Foster, Jacob “Cubbie” Fink and Mark Pontius in Los Angeles, 2009, after several years of frustration by Mark Foster working as a jingle writer. After writing and recording the song “Pumped Up Kicks,” and releasing it online, the band went viral, being offered a record deal by Startime International and going on to develop a strong and devoted following by playing small club shows and music festivals. After their debut album, “Torches,” was released in 2011, “Pumped Up Kicks,” became even bigger, reaching number 3 on the Billboard Hot 100, and leading to two Grammy Award wins for Foster The People, one for the album, and one for the single. The band are currently on tour with their latest album, “Supermodel.” A concept album, “Supermodel,” deals with “the ugly side of capitalism,” focusing on issues within consumerism and popular culture, featuring light-hearted instrumental sections in contrast with darker lyrics, and overall a far more serious sound than their debut. The difference is both startling, provocative, and evidence of the bands growth as individuals and musicians. Uncut statedl "the sound they've fashioned is glossy and supersaturated while still exhibiting the subversive impulse that yielded the supremely catchy but subtly sinister smash 'Pumped Up Kicks’”. 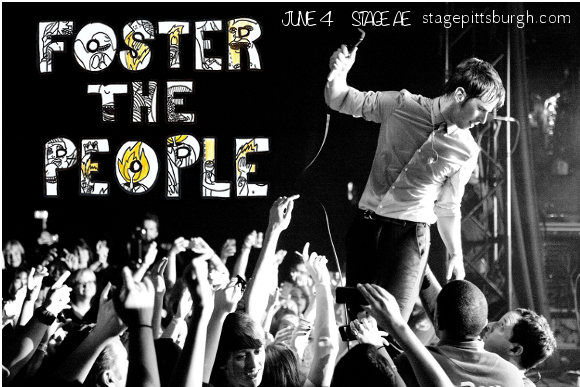 Don’t miss your chance to catch Foster The People live!! Got your tickets yet? ?